Located in the arid Peruvian coastal plain, some 400 km south of Lima, the geoglyphs of Nasca and the pampas of Jumana cover about 450 sq. km. These lines, which were scratched on the surface of the ground between 500 B.C. 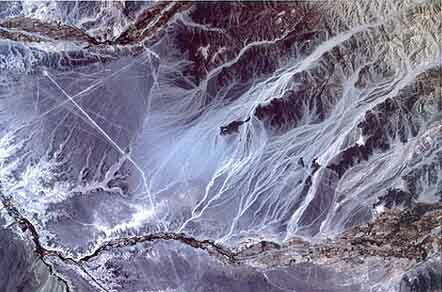 and A.D. 500, are among archaeology's greatest enigmas because of their quantity, nature, size and continuity.The Nazca lines are thought to have been created by the Nazca Indians who lived in the region . Since most of the biomorphic figures are only up to several tens of meters in length, they cannot be identified from satellite images. In the latter half of the 20th century, however, Landsat captured a huge arrow-like figure 50 kilometers long that points to South. The ADEOS/AVNIR also imaged a portion of this figure. These figures etched on the earth have led to some fanciful theories about their purposes, including the signals to interplanetary visitors or runways for alien spaceships.